WASHINGTON, D.C. -- As Congress grapples with the challenges facing Puerto Rico, they can't be explained away in 140 characters. Rep. Diane Black, R-Tenn., may have fallen into a rhetorical trap when she stated her opposition to a bailout for Puerto Rico in a tweet. While the tweet may have pleased her conservative constituents, it oversimplifies and somewhat conflicts with her other views on the Puerto Rico crisis and potential solutions. It all started last June when Black took offense at the use of the name Tennessee by Puerto Rico statehood supporters. The Tennessee Plan is the name of a strategy adopted by the current government of Puerto Rico to achieve statehood by deploying a delegation, dubbed the Democracy Commission, to lobby Congress. A similar process was followed first by Tennessee and later by six other territories to become states. The response to the tweet from the Puerto Rican twittersphere, particularly statehood supporters, was immediate. 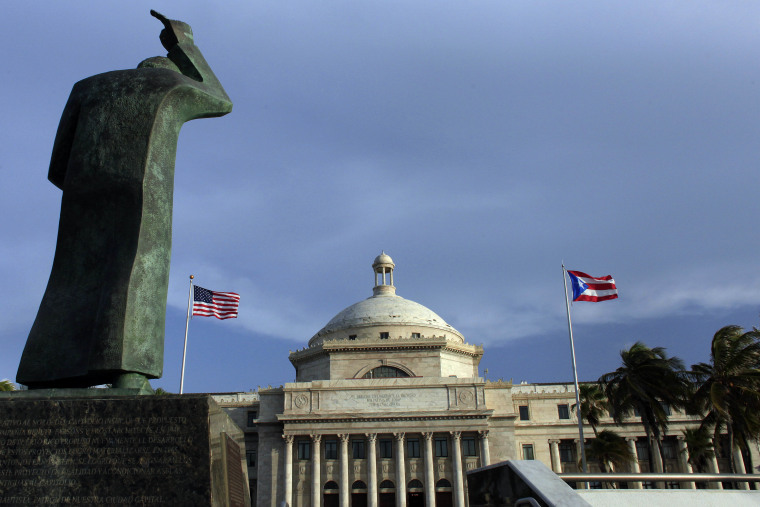 RELATED: What's Next in the Fight for Puerto Rico Statehood? If one were to rank patriots and volunteers, Puerto Ricans would be at the top of the list. As U.S. citizens they have fought with distinction in American wars since the Island was invaded in 1898, even though they cannot vote for their commander-in-chief. And the Republican party platform did come out in support of Puerto Rico statehood. Until now, most Puerto Ricans had never heard about Black, who has had remarkable rags to riches life. Black was the first person in her family to graduate from college and worked as a nurse for 45 years before entering politics. Together with her husband she founded Aegis Sciences Corp, a drug testing company valued at $750 million, which makes her one of the richest members of Congress. In 2010, she won her House seat as a Tea Party candidate. She is one of two female U.S. representatives who insists on being called congressman. She currently chairs the House Budget Committee, which sets revenue and spending levels for the annual federal budget. And just last week she entered the race for governor of Tennessee. Given the outburst provoked by Black’s tweet, it is not surprising that Puerto Rico Resident Commissioner and statehood advocate Jenniffer González requested a meeting with her. This statement is consistent with an earlier tweet where she rolled up El Cuco, the Boogeyman and La Llorona into one giant conservative nightmare. A previous statement by Black, however, suggests she knows better than to call the federal government's efforts to reverse Puerto Rico's economic crisis a bailout. As President Trump himself would say, it’s complicated. Last year, Black issued a statement to explain her vote against the Puerto Rico Oversight, Management, and Economic Stability Act (PROMESA). This is the law that established Puerto Rico’s Financial Oversight and Management Board to control the budget and restructure the debt. “While I am pleased that this bill avoids a taxpayer funded bailout of Puerto Rico, I believe the legislation is ultimately a Band-Aid on a larger problem. The bill will help Puerto Rico avoid a default on its debts in the near term, but it failed to include the pro-growth reforms needed to make the island more fiscally solvent moving forward. Additionally, I believe the legislation lacks sufficient flexibility on the restrictions of the Jones Act, which inhibits trade, and on the minimum wage," Black said. Black’s statement is encouraging in that it recognized two issues that are essential to Puerto Rico’s economic recovery. First, Black faults PROMESA for its lack of pro-growth reforms. These reforms are needed to offset the austerity measures required by PROMESA, which will exacerbate Puerto Rico’s 11-year recession. Second, Black supports elimination of the Jones Act, the federal law that prohibits the use of foreign built or flagged vessels to transport goods between U.S. destinations. Its purpose is to maintain a war-ready U.S merchant marine. Its side effect, however, has been to decrease competition, increase shipping costs and cost of living. Noncontiguous areas like Puerto Rico, Hawaii and Alaska bear the biggest cost burden because they lack alternative land routes. Because of the Jones Act, groceries in Puerto Rico cost 25.4 percent more than the U.S. average. Because of the Jones Act, the cost per gallon of gasoline is 15 cents higher and Puerto Rico’s state-run authority pays 30 percent more for liquefied natural gas. Perhaps based on her knowledge of Tennessee, which is among the poorest and cheapest states to live in the nation, Black assumes that there is a causal relation between poverty and cost of living. There is none in the case of Puerto Rico. The cost of living in the San Juan metropolitan area is 11.6 percent higher than the average in other U.S. metropolitan areas. Utilities are among the most expensive because of the inefficient and outdated electrical system, plus fuel transport costs imposed by the Jones Act. Lowering the minimum wage, as Black suggests, will only have a positive economic impact on the airlines that fly Puerto Ricans migrating north in search of jobs. The number of Puerto Ricans in Tennessee is minuscule. Black does not need them to win an election, which is why it is encouraging that her views on Puerto Rico are not entirely based on her desire to win votes, but on a set of conservative principles, some of which are compatible with Puerto Rico’s interests. As a self-made woman, Black values self-reliance. She does not like bailouts and neither do Puerto Ricans. They just want jobs like everybody else and sometimes this requires a federal investment. She understands that the Jones Act is an economic impediment and as chair of the House Budget Committee, she has leverage to demand a Jones Act emergency exemption for Puerto Rico at zero cost to American taxpayers. First impressions are often deceiving. Black's outlook on Puerto Rico is more complex than it initially appears from her tweets. She may be opposed to a bailout, but she also recognizes that cutting off Puerto Rico is not the answer. One would hope that the congressman will reconsider her first impression of Puerto Rico too, and that she and fellow members reach out to the citizens of the U.S. colony to find common ground and solutions. Gretchen Sierra-Zorita is a policy and communication strategist, focusing on Latino and Puerto Rican issues. She handles media diversity issues for the National Hispanic Foundation for the Arts and is curator of Puerto Rico en Serio.